The Groundtracks Layer draws satellite groundtracks on the maps displayed in the Viewing Window. This allows planetary geologists and mission planners to determine where various spacecraft were, or will be, at any given time. A groundtrack represents the points directly beneath a spacecraft as it orbits a planet. 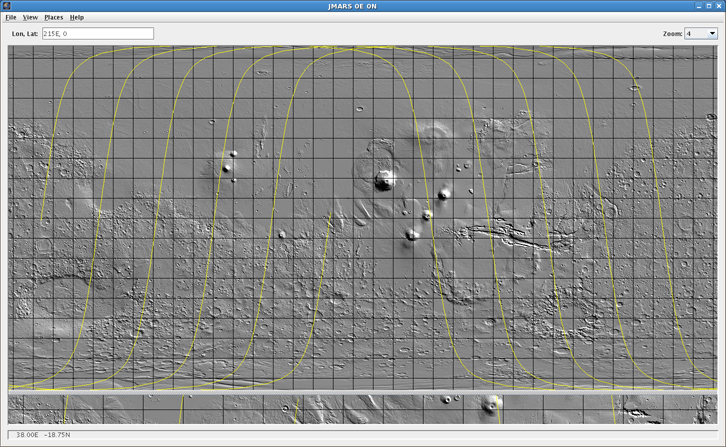 The Groundtracks Layer is available in all JMARS releases. 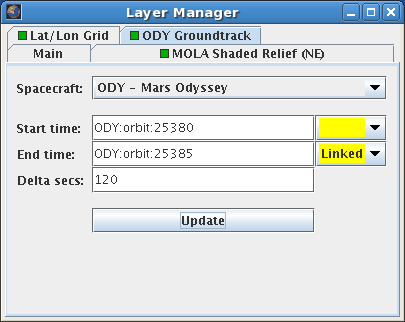 Open the Groundtrack Layer: In the Layer Manager, chose "Add New Layer" -> "Groundtracks"
Select a Spacecraft: Using the "Spacecraft" drop-down menu, select either Mars Odyssey (ODY), Mars Global Surveyor (MGS) or Mars Express (MEX). Select Start and End Times: Since the positions of the satellites are defined as functions of time, a start and end time for the groundtrack must be given. Any of the many acceptable JMARS Time Formats can be used. Select a Sampling Frequency: The groundtrack is caluclated at discrete points and the "Delta Secs" option allows users to specify how often along the groundtrack a point should be calculated. The default value is 120 secs, which is optimal for most JMARS functions. At higher values, the groundtracks will start to appear as a series of line segments instead of a smooth curve. At lower values, the Groundtracks Layer will load slower since JMARS has to calculate the spacecraft position at a larger number of points. Select a Ground Track Color: The default color of the groundtrack that will be displayed is "yellow", but if colorized layers are being used a different groundtrack color may be more visable. Display the Groundtrack: Once these four parameters have been entered, click "Update" to draw the desired groundtrack. Users can return to the Groundtracks Layer focus panel in the Layer Manager at any time to adjust these parameters. A sample of the Groundtracks Layer focus panel is shown below and the corresponding groundtrack is shown in the figure above.